Jumplists is an interesting and very useful feature in Windows 7 operating system. A mouse hover over application button on the taskbar pops-up a box with quick access features, tabs and options of that specific application. 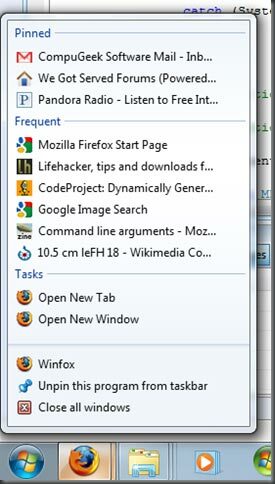 Jumplists works like charm for Internet Explorer in Windows 7 but not is same for Firefox browser.